Update (6/6/13): Besides the previously announced Bowman-brand autographs, Topps has unveiled plans for additional Yasiel Puig cards. 2013 Topps Tier One Baseball will have a limited amount of autograph redemptions. The first official rookie cards appear to be headed for 2013 Topps Allen & Ginter Baseball, which will also have a small number of autograph redemptions. Starting with Bowan Inception, Puig will have cards in all remaining 2013 products. Panini has also announced Yasiel Puig cards will be included in both 2013 Pinnacle Baseball and 2013 Panini Prizm Baseball. Fresh off a successful MLB debut, collectors are scrambling for Yasiel Puig cards. Although there are some out there, the super prospect has actually appeared in very few sets. That number becomes even smaller once you look for cards of Puig wearing a Dodgers uniform. Not surprisingly, that's going to change quickly. Topps has already announced plans for a few Yasiel Puig cards, although it's likely there will be plenty more before the last 2013 set is released. 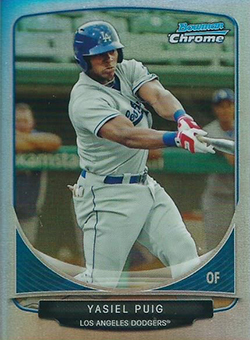 Hours before Puig made his first start with Los Angeles, Topps announced the Cuban-born outfielder would be the fourth 2013 Bowman Baseball Lucky Redemption. The yet-to-be-unveiled card will have an on-card autograph and be part of the season-long Blue Sapphire inserts celebrating Bowman's 65th anniversary. Topps also announced Yasiel Puig autographs are slated to appear in 2013 Bowman Inception, 2013 Bowman Platinum and 2013 Bowman Chrome. Now that Puig has appeared in his first MLB game, he is now eligible for official rookie cards. The first Yasiel Puig cards can be found in Leaf products. His autographs include 2012 Leaf Valiant, 2012 Leaf Metal Draft, 2012 Leaf Ultimate Draft and 2012 Leaf Memories Baseball. Puig also appears in a pair of 2013 Bowman Baseball insert sets: Cream of the Crop Mini Refractors and Topp 100 Prospects. While both of these have parallels, none are signed.